Cultivated area of pineapples for export in Costa Rica grew in the last two decades leading to serious environmental and health damages to local communities. Pineapple monocultures in Costa Rica have been growing dramatically since the end of the previous century. From 1990 to 2009, the cultivated area grew 675% to almost 50000 ha and, in 2015, it had arguably reached almost 60000 ha. Costa Rica is the main exporter of pineapple (since 2007) having North America (53%) and the European Union (44%) as main destinations (2015). Production is heavily concentrated: Del Monte and PINDECO - the biggest companies – have 50% of Costa Rica’s pineapple output. The first 31 companies concentrate 96% of total production. Small landowners although big in number, produce the remaining 4%. 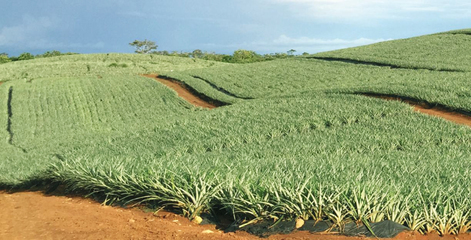 Pineapple monocultures have become a major source of both environmental and social impacts in Costa Rica. Apart from the land use changes that threaten the country’s forests and wetlands, the agrochemicals used in the plantations have been polluting both surface and underground waters. In the municipality of Siquirres (Huetar Atlántico region), the communities are consuming water from tankers since 2007 due to the presence of 3 substances used in pineapple monocultures: Bromacil, Diurón and Tridamefón. At that time, the Instituto Costarricense de Acueductos y Alcantarillados (Costa Rica’s public water provider) denounced the plantations proximity to springs, violating the country’s Law. The agrochemicals mentioned above are only a small part of the substances required in pineapple monocultures, especially for the variety MD2 (also known as ‘Sweet Gold’). Many of these substances are associated to different health hazards – including cancer - and are forbidden in some countries. Exposure to agrochemicals threatens not only the communities leaving nearby but also the workers, who are often sprayed while at the plantations. Pineapple monocultures are also responsible for higher land concentration, the displacement of peasant families and the loss of food sovereignty. Moreover, stockbreeders have been complaining about water contamination and the persistence of Stable Fly (Stomoxys calcitrans) plagues, associated with the crops. Finally, the pineapple industry in Costa Rica is infamous by its lack of adequate labour standards: salaries are low, working days are long and basic benefits (such as social security) aren’t respected. The situation is particularly difficult for migrant workers. Faced with all the negative consequences of pineapple monocultures, the successive Governments of Costa Rica have been extremely lenient with producers. The importance of the crop in Costa Rica’s economy and the influence of the Cámara Nacional de Productores y Exportadores de Piña (CANAPEP) have been major factors in the State’s incapacity to take action. Producers are hardly sanctioned for breaking the Law and the activity benefits from extremely low tax burdens, due to Free Trade Agreements and national legislation. Governments have ignored UN recommendations and seem to only care when the European Union officials visit the country, though they’re more interested in protecting consumers in Europe than the people in producing regions. Furthermore, key people at the Government have constantly refused to participate in meetings with communities and to address questions posed by the press. The Government , through the Secretaría Técnica Nacional Ambiental (SETENA), went even further by creating (in 2009) a voluntary ex-post mechanism for impact analysis that, in practice, allowed producers to bypass the requirement for an Environmental Impact Assessment. Some years later, in 2011, the vice-presidency of Costa Rica launched the Plataforma Nacional de Producción y Comercio Responsable de Piña en Costa Rica, sponsored by the United Nations Development Program (UNDP). However, the initiative was criticised from the beginning because its administrator was an ex-member of the export sector (closely linked to CANAPEP). Costa Rica’s president, Luis Guillermo Solís, was a fierce critic of the situation brought by the pineapple monocultures while in opposition and even defended a moratorium on new crops. However, things have not changed much since 2014, when he assumed office. Affected communities, together with urban allies, have been actively opposing the expansion of pineapple monocultures and demanding harsher measures from the State. The most important platform against the crop is the Frente Nacional de Sectores Afectados por la Producción de Piña (FRENASAPP). 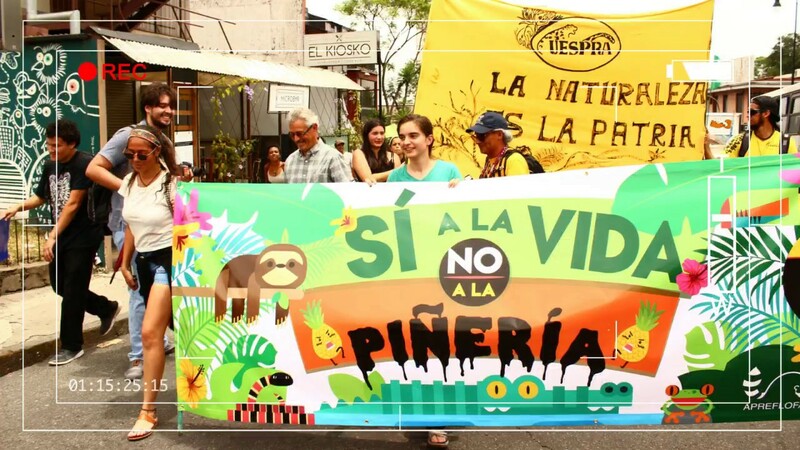 The FRENASAPP has actively participated in different protests and marches demanding a moratorium on pineapple crops. Only in 2017, together with other organized groups, they called for a march in May and another one in June. Their actions have not yet been able to put a stop to new plantations, but they managed to suspend a new project by Del Monte, close to a wetland in the south of the country. Furthermore, they were able to pressure the Government into forbidding Bromacil, one of the most dangerous agrochemicals still in use in Costa Rica. However, the remaining substances still pose a threat to the environment and to people’s health. The communities pressure has also forced some local governments to take action. In 2012, the municipalities of Guácimo and Pococí issued a decree prohibiting new crops. However, the CANAPEP managed to revert both decisions in court. In 2016, the supreme court of Costa Rica, once again invalidated a moratorium decreed in Los Chiles. Despite these attempts, community and environmentalist pressure and even the recommendation of Costa Rica’s National University on a moratorium, the Government refused to address the issue. Another important actor in the struggle have been the plantation workers, namely through the Sindicato de Trabajadores del Sector Privado (Sitrasep CR), a union present in some pineapple companies, organised a strike in 2016 with the workers of Exportaciones Norteñas S.A in Los Chiles (Huetar Norte region, close to the Nicaraguan border). They were able to reach an agreement with the company for better wages. They went on strike one more time in January 2018, but still without any results. Except for some minor skirmishes in a roadblock in Guácimo and some police repression in the 2018 strike, it appears that the struggle has not been marked by violent episodes. Exports are reported at over one billion USD per year. Relevant government actors Cámara Constitucional de la Corte Suprema; Secretaría Técnica Nacional Ambiental (SETENA); Instituto Costarricense de Acueductos y Alcantarillados (AyA). Environmental justice organisations and other supporters Several communities, some organised at the Frente Nacional de Sectores Afectados por la Producción de Piña (FRENASAPP). Supporters: Universidad de Costa Rica; United Nations; Federación Conservacionista de Costa Rica (FECON). Development of Alternatives Stop the monoculture expansion and promote other forms of relationship with nature through agroecological alternatives. Why? Explain briefly. In spite of some minor victories - Bromacil was forbidden, the southern project was suspended - few has been done to stop the threat posed by pineapple monocultures in Costa Rica. As a result, the scenario is still one of defeat for those struggling against the industry. Other Comments Pineapple is "piña". 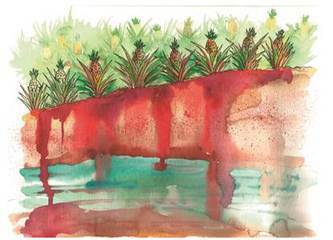 The word "piñería" -(imitating "minería" (mining)- is a new concept referring to the monocultures of pineapples. Hence the slogan, "sí a la vida, no a la piñería" (yes to life, no to "piñería").